The increase in crude oil prices appears to be sustainable so far, as oil-producing countries have agreed to production cuts. This could see an increase in the petroleum-based solvents that paint firms use. If the rising crude prices sees derivatives such as plastics becoming expensive, that can result in higher packaging costs. Lastly, freight costs will increase once fuel prices are hiked. 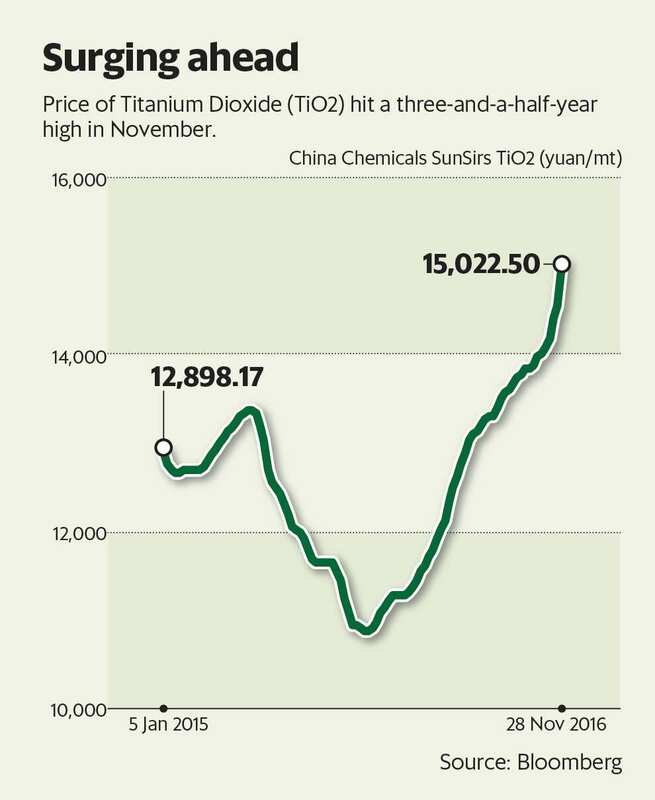 Another key raw material, titanium dioxide (TiO2), has seen prices rise both month-on-month and over a year ago. Firms import their requirement and could see their costs increase as contracts get renewed at higher rates. If lower costs helped firms improve profitability in the past (even if demand was not as strong), they now face a situation where rising costs may eat into margins. If average oil prices increase by a further 10%, the estimated FY18 EPS for consumer firms such as Asian Paints Ltd and Berger Paints India Ltd could be lower by 8%, other things remaining same, cautioned JM Financial Institutional Securities Ltd in a recent report. EPS stands for earnings per share. The timing makes it worse. Demonetization has affected decorative paints demand, a segment that is discretionary by nature and cash plays a key role. “Our channel check suggests demand in decoratives segment has fallen 40% in November and December. For the industrials segment, volumes have been affected to the tune of 25%," Amit Agarwal, a Kotak Securities analyst said. In a recent Nomura report, the managements of major paint companies such as Asian Paints and Berger Paints said offtake is down, with Berger stating that demand is down to 40-45% of its original level. They also said the situation is improving as dealers have begun moving to digital payments. Still, volume growth is expected to be under pressure for two quarters. Some brokerages have trimmed their earnings estimates of paint companies factoring in lower volumes. “We have cut earnings for Asian Paints higher than for most consumer companies," said a Motilal Oswal Securities Ltd report. That makes for a sobering outlook even as there is uncertainty on whether oil prices can go up further. Though demonetization is not a structural issue, it has jolted demand, and it is difficult to judge how soon consumption will recover to normal levels. Thus, paint stocks could remain under pressure till signs of a recovery come in sight.